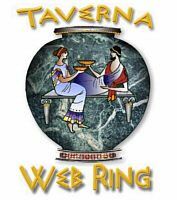 Welcome to Taverna's Web Ring page! If you are having problems installing your Taverna webring, please e-mail the Oracle for the Goddess Demeter. She will assist you. Be sure to also check Elysium Gates Web Ring page for a complete listing of web rings throughout Elysium Gates. If you are the administrator for a web ring be sure to get your ring listed on that page!